The Clause IV is included in the Labour Party Rule Book, which is the governing document for the Labour Party. Namely, Clause IV is one of the most important element of the first part, known as “Constitutional Rules”, because it states the aims and values of the Labour Party. 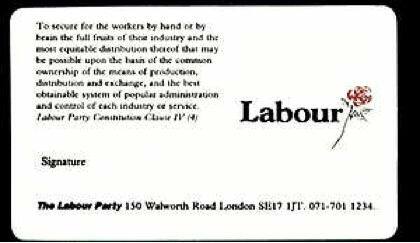 In 1993, Tony Blair wrote a pamphlet for the Fabian Society in which he criticised the wording of Clause IV: the party means and ends were not clearly stated, he argued. In 1995, as leader of the Labour Party, Tony Blair succeded where Gaitskell had failed 36 years before: he defeated the left-wing opposition and completely re-wrote the Clause IV. The distance of Blair’s New Labour from the ‘old left’ was symbolically represented by this achievement of his leadership. (Labour Party Constitution, ‘old’ Clause IV). “The Labour Party is a democratic socialist party. It believes that by the strength of our common endeavour we achieve more than we achieve alone, so as to create for each of us the means to realise our true potential and for all of us a community in which power, wealth and opportunity are in the hands of the many, not the few. Where the rights we enjoy reflect the duties we owe. And where we live together, freely, in a spirit of solidarity, tolerance and respect (Labour Party, New Clause IV)”. The distinction between manual (“work by hand”) and intellectual work (“work by brain”). The category “workers” (i.e. the ‘old’ beneficiary of party actions). The ‘common ownership’ principle (i.e. nationalisation). State control over economic activities / services. The term “industry” in the Old Clause IV (“workers’ industry”; “each industry”), is replaced with the terms: “endeavour” (“our common endeavour”) and “duties” (“the duties we owe”) in the New Clause IV. Endeavour v. ME.[f. EN-1+DEVOIR sb. ; cf. F. se mettre en devoir de faire quelque chose to make it one's duty to do something; hence, to endeavour.] †1. refl. To exert onself -1655; †trans. to exert (one’s power, etc.) -1642. †intr. for refl. To exert oneself; to direct one’s efforts -1624. 3. intr. To try, strive, make an effort for a specified object; to attempt strenuously. The only mod. sense. 1594. 4. trans. To use effort for; to attempt (now arch.) 1581; †to try to fulfil (a Law) Endeavourer one who endeavours; an aspirant; also spec., a member of the Christian Endeavour Society founded in U.S. in 1881.
means > “the common ownership of means of production” / “popular administration of each industry and service”. end > “the most equitable distribution”. means > “by the strength of our common endeavour”. end 1 (“for each of us”) > “to realise our true potential” / “achieve more”. end 2 (“for all of us”) > “[to create] a community in which power, wealth and opportunity are in the hands of the many, not the few”. “The Labour Party is a democratic socialist party. The Old Clause IV constructed its addressees by naming them – “workers” – and defining them according to social and economic criteria. Addressees were ideologically (i.e., a specific vision of the world is assumed as shared by addressors and addressees) involved in the attainment of specific objectives (“the most equitable distribution” of workers’ industry). those who don’t want this to take place. The New Clause IV constructs its addressees without naming them (each of us, all of us, community, the many) and involving them morally, not ideologically. Moral reflections are addressed to all British citizens, not to specific social groups. Thus, it is not necessary to share an ideological vision of the world and power relations within society. Party transitive action turns into an intransitive moral authority. The addressees are not specified: this means that everybody is included and there are no political opponents to fight. The party is inside society and does not perform any action: this means that the agent (i.e. the party) loses its role. The new Clause IV does not imply a narrative plan, because the agent does not stand apart as the source of action. The agent coincides with the indefinite beneficiary, who is the real source of action. The rewritten Clause IV removes the political programme contained in the old Clause IV and builds a moral statement on human nature.